Issued by Go! Overall excellent condition with its original factory fold lines. 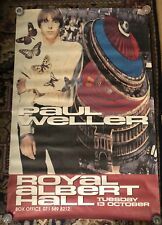 Artist : Paul Weller. ’MR. PAUL WELLER’ FROM 1977. IN FULL PETE TOWNSHEND JUMP MODE! WHICH IS WHAT IT RICHLY DESERVES.AND WOULD MAKE IT LOOK EVEN MORE STUNNING! DON’T MISS IT.IT’S A BEAUTY!! Ex = shows little or no sign of any wear and tear. (The Jam song). pin holes and a very small slither missing from one corner. #11 Fly on the Wall. #21 Kosmos. #16 Into Tomorrow. #13 Amongst Butterflies. #20 All Year Round. #14 Headstart for Happiness. 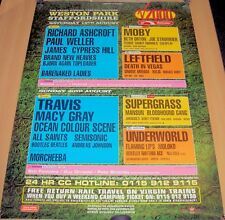 Th AUGUST 2000 AT WESTON PARK STAFFORDSHIRE U.K. Ex = shows little or no sign of any wear and tear. Although it has been opened and used it is complete and intact. Almost new. Ex = shows very minimum signs of ageing and wear and tear.